Owase City, Mie, the seaside town with 18,000 residents. Owase consists of city center and 9 Ura( small villages in fleets). This series of column introduces Owase city and surrounding tourism spot. This second time, I visited Kumano kodo center, only a minute of walk from Yumekodo Owase, with Masashi Ito, a manager of Yumekodo Owase. 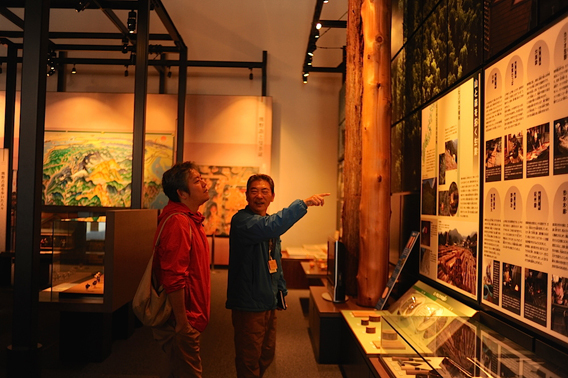 Why don’t you stop by Kumano kodo center when you visit Yumekodo Owase. A minute of walk from Yumekodo Owase. This time we visited Mie Prefectural Kumano Kodo Center. This is a facility called “a gateway of Kumano Kodo”, the world heritage that you walk by. Entering the facility that is built with Owase lumbers of 6,549, the scent of Hinoki(Japanese cypress) welcomes you. 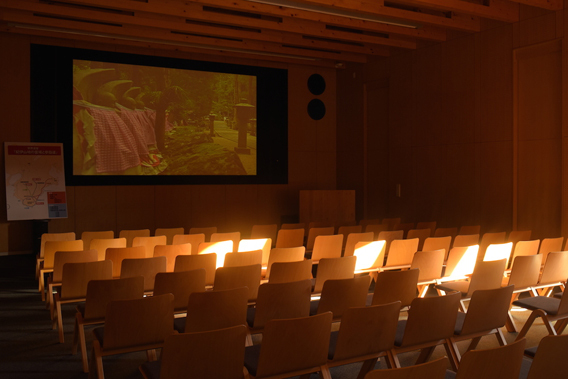 When you visit Kodo center for the first time, why don’t you watch a film at audio-visual room. The film will tell you about Kumano kodo. You can ask a staff for screening if it is not going (Screening is available from 1 person. 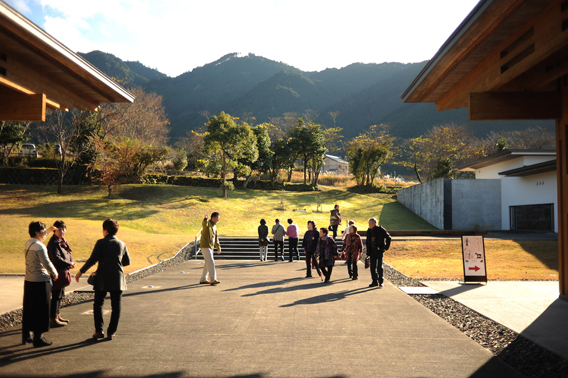 Kumano Kodo center is a facility that introduces “Sacred Sites and Pilgrimage Routes in the Kii Mountain Range”, which was listed on the world heritage list in 2004. This world heritage includes three Kumano Grand Shrines (Kumano Sanzan) of Kumano Nachi Taisha enshrining rocks, rivers, and waterfalls, Kumano Hayatama Taisha, Kumano Hongu Taisham, Koyasan Kongobuji, a head temple placed by Kukai of Shingon Esoteric Buddhism, and Kinpusenji of Shugendo blief. The routes tying these sacred sites are collectively called “Sacred Sites and Pilgrimage Routes in the Kii Mountain Range”. Pilgrims visited from all over Japan from the ancient times of Heian Period(794-1185). The belief is rooted in a worship of nature that enshrines trees, water, and rocks. It started from a profound nature of Kii mountain range. After watching film, Mr. Seko in Kodo center guided us. “Kumano Kodo has four routes. This facility is located in the way of Iseji, one of those four routes. Have you been to Oise-San (Ise grand Shrine)? Pilgrims who visited Ise Grand Shrine used to walk more miles to Kumano Sanzan”. “Visiters in a present time are provided with bus tour going around Kumano Sanzan. They first visit here and head off to Kumano area”. 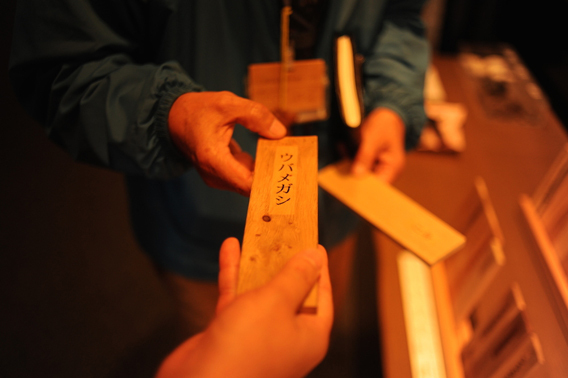 He taught us about the nature of Kumano Kodo at exhibition spot. Among 1.052 listed sites as world heritage, there are 10 sites that are qualified as a route (by 2016). 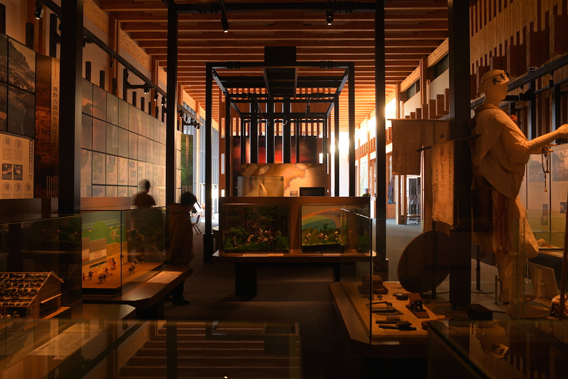 Exhibition tells you an attraction of walking Kumano Kodo. For instance, a panel named “trees and grass bearing red fruit introduces nandina and Rubus buergeri. 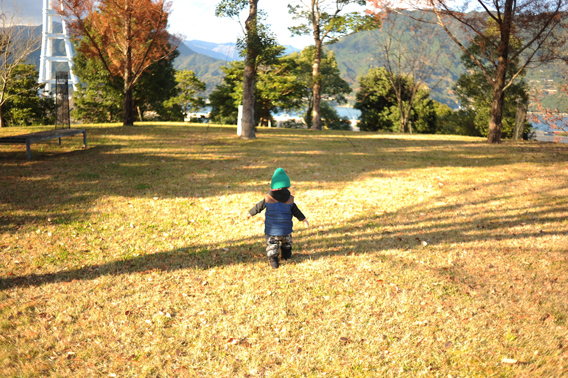 It seems Walking Kumano Kodo in autumn and winter is fun. Next to exhibition panels are a series of lumber pieces. The number is approximately 50. Here Mr. Seko passed me 2 pieces of lumbers. One of them was light as a piece of paper, and the other is heavy. Weight, scent, and hardness are completely different even they are both woods. “The light piece is princess tree, often used for making drawers. The heavier one is oak. This species is an ingredient of Kishu Binchotan ( a branded charcoal). People cut down trees and produce charcoal in a cycle of 20 years”. Other than Kishu Binchotan, people produces Nababushi(a boiled and half-dried bonito), Ichigi-momen (authentic cottom) , or Owase Wappa(a circular lunch box) in this Kii mountainous area. Kumano Kodo might be a scenery made by residents and pilgrims. We asked Mr. Seko what kind of place Kumano Kodo was. “Kumano Kodo is a place where you get yourself back by walking and feeling nature, which is different than tourism spot where visitors simply visit and spend some money. That is what I think”. “For this reason, how you welcome visitors is very important. we are proud of our job”. At this point, a group of visitors from Tokai area arrived. staffs welcomed the group and started guiding them. 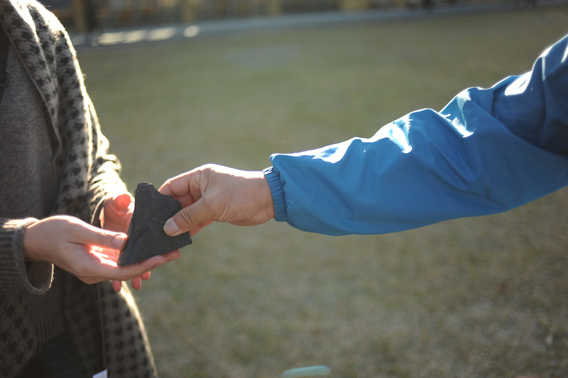 Offering taking a photo for a couple or introducing Nachiguro stone arranged on the ground-. At the end, staffs waved hands to see them off. It looked like visitors are welcomed at a hotel. Mr. Seko said “There are some time when One of visitors presented us a gift. some emailed us saying “please say thank you to our guide”. 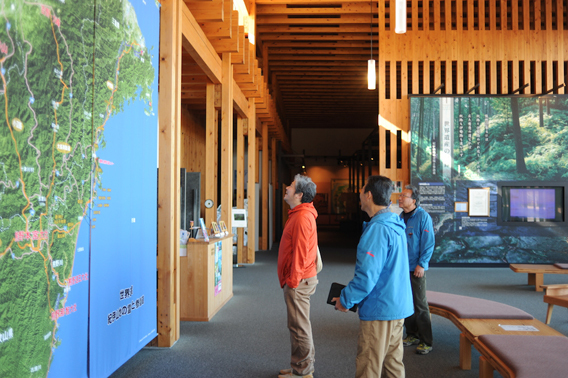 He also said he wanted people visiting for spa, not only Kumano Kodo visitors, to visit Kumano Kodo center. 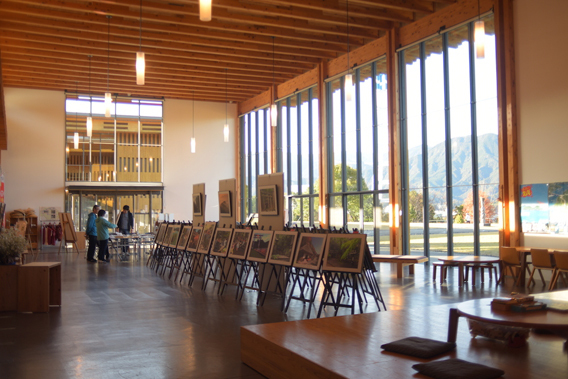 Komano Kodo center offers seasonal exhibition, talk event, trial class, or Kodo tour in addition to usual exhibition. Why don’t you stop by when you come visit Yumekodo Owase. Address: 12-4, Mukai ,Owase city,Mie.